Is Day-Timer Right for You? Keeping your schedule, to-dos, appointments, addresses, and expenses organized can be tough. There are so many different methods to the madness, but it’s only counts if you have a system that works for you! We’re making it easy to know if a Day-Timer is right for you, if anything below describes you a Day-Timer could be the right fit! If you’re a visual person, a Day-Timer is for you! We make it easy for you to quickly flip to a page and see all your to-dos, which meetings you have and when, the date of your father-in-law’s birthday, and even that reminder to pick up your prescription. It’s all there, written in your Day-Timer! Is it a struggle to stay on top of all you have going on? A Day-Timer could definitely help you! It’s hard to organize everything in your life! There’s work, your personal life, all your appointments, to-do lists, bucket lists, managing expenses… even we’re getting tired! So of course it can be hectic managing it all! 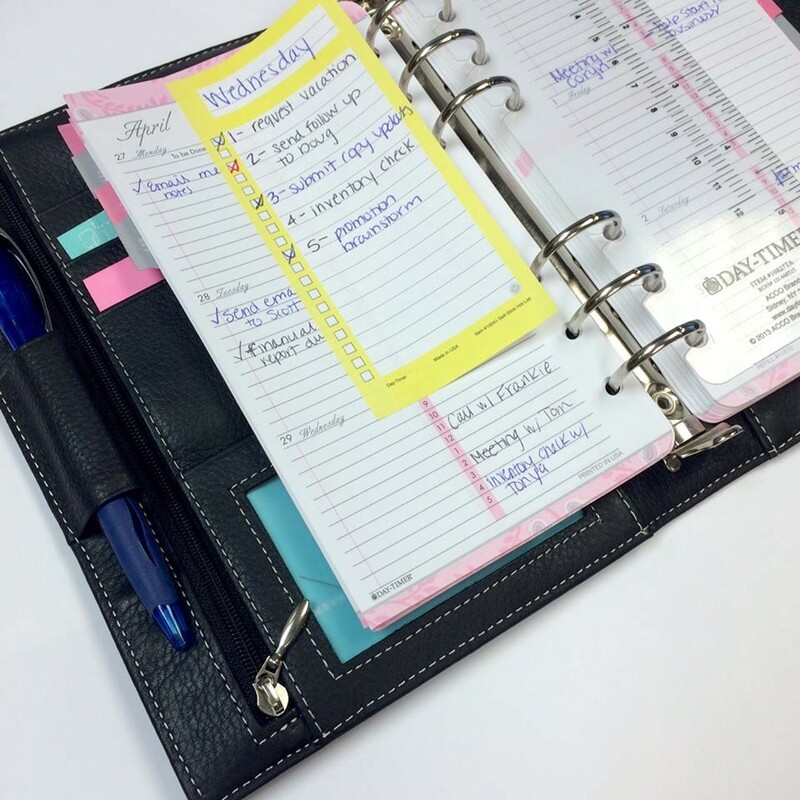 A Day-Timer has lots of sections and accessories to keep yourself organized in one spot! Only have time for a 2 second downloads of your schedule? Use a Day-Timer for that! Just jot down your big events, work trips, and birthdays in your Day-Timer. One glance at your monthly spread and you’ll be up to speed on when everything occurs. Are you detail oriented? You’ll love the one or two-page per day Day-Timer! It gives you plenty of space to write down every last thing you need to get done each day. But we know the best part is the feeling when you cross something off in your Day-Timer! Journaling is coming back, and a Day-Timer is perfect as your journal! The two-page per day refill gives you the open and organized layout you need to write all your thoughts. If one of these described you, a Day-Timer might be exactly what you need! Search what organizers or refills could work for you on our website!